At Visit Sun Valley’s quarterly meeting Tuesday, Sept. 30, the Ketchum YMCA conference room was packed and people were listening. Concerns about the Sun Valley Lodge’s temporary closure, the expanding use of social media in marketing the region and summer business results were on the agenda. Room nights sold in Sun Valley, Ketchum and Hailey were up from 2013 in June, July and August, Schieven indicated. August saw the biggest jump, with a 17 percent increase in room nights sold—more than 30,000 for the three cities. Visits to the Sun Valley Marketing Alliance’s website—which uses the Visit Sun Valley name—between May and the end of September were up by 41 percent. The majority of “click-throughs” came from Boise and New York. In 2014, to date, there were more than 100,000 more website visits than the fall 2013 equivalent, Schieven said. Some of the top digital performers for the summer marketing campaign were Pixel Mags, Expedia and National Geographic. Visit Sun Valley is continuing the same “Seek Universal Truths” campaign from summer into the winter. The campaign invites target audiences—mainly San Francisco, Los Angeles, Seattle, Denver and now New York residents—to visualize themselves in iconic local settings, from a mountain bike trail to a summer symphony at the Sun Valley Pavilion. Marketing research has shown that potential visitors don’t want to be sold to, Schieven said, and they’re craving an escape from the daily grind. That’s why the Marketing Alliance distributes print and video advertisements that cater to authentic experiences, she said. Schieven aired a 60-second clip from the upcoming winter campaign featuring upbeat music and an emphasis on the outdoors: snowboarders and skiers careening down Baldy slopes, friends enjoying beer at an outdoor winter event, children playing hockey at the resort. A female audience member asked if there could be more emphasis on the arts and cultural scene in the Wood River Valley. Schieven replied that while recreation is the area’s main tourism draw, her organization tries to showcase other facets of the Sun Valley experience on its website. The Sun Valley Marketing Alliance worked with just under $500,000 for its summer 2014 marketing campaign, money partially allocated from a new 1 percent local-option-tax that started in January. The 1 percent LOT goes to the Air Service Board, created to create new flights into Friedman Memorial Airport and attract tourists to the valley through marketing and advertisements. The budget for this winter, Schieven said, is approximately $600,000. An additional $40,000 will go toward regional marketing and $20,000 to expand into Nordic skiing markets. Los Angeles and San Francisco targeting takes up the bulk of the $600,000; marketing to each of the California cities will take up about 22 percent of the budget. Seattle and New York came in second, at 16 percent each. Schieven said her organization has expanded its print and digital presence in the market. It has begun running ads with AFAR and Competitor magazines, travel and fitness publications, respectively. Advertisements aren’t the only way to bring new visitors into the valley, said Greg Randolph, the organization’s public relations and social media director. It has brought high-profile photographers with tens of thousands of Instagram friends (a social-media platform based on photo sharing) into the valley to capture the regional beauty. He said Instagram attracts “more relevant eyeballs” and creates intrigue and regional knowledge building. The Marketing Alliance also pays for Facebook advertising, which merited high click-through rates this summer, he said. Randolph said he brought four journalists to Sun Valley last spring in order to draw their readers into vacationing here and plans to bring more to experience the winter recreation. Skiing magazine and Aspen magazine, among others, have features on Sun Valley in their upcoming publications, he said. The end of the meeting was spent assuaging business owners and other residents with bank accounts tied to the Wood River Valley’s economic success that the closure and renovation of the Sun Valley Lodge won’t create a ripple effect that’s bad for business. Sun Valley Co. owner Carol Holding and her son, Stephen, announced plans last spring to close the 1936 hotel for a nine-month remodel and addition. While the remainder of the resort is open, the Lodge closed Sept. 1 and is set to reopen in June 2015. 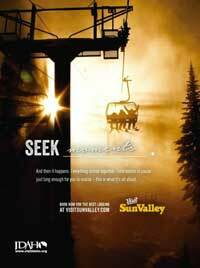 Sun Valley Co. and Visit Sun Valley work in tandem on regional promotion and advertising campaigns. Sibbach said Sun Valley Co. estimates a 10 percent decrease in resort occupancy levels this winter, though it depends on the weather. “We think there’s going to be a shift to Ketchum,” Schieven added.